Let us go through some basic concepts for automating SQL database maintenance tasks with the SQLCMD utility. What is a Database Maintenance Task? A database maintenance task, as the name indicates, is a task which assists in managing or maintaining a database to ensure its smooth operation. For example, creating database backups on daily basis is a database maintenance task which ensures that the database is backed up, so that in case of any incident, which ends up either corrupting the database or making it unstable, it can be restored successfully without losing any data. Who Performs Database Maintenance Tasks? Typically, professionals responsible for database system maintenance, such as database administrators, perform database maintenance tasks, however, this may change under certain circumstances. How is a Database Maintenance Task done? A database maintenance task is normally performed manually by a database administrator from time to time, or it can also be scheduled to run automatically. What Does Automating a Database Maintenance Task Mean? Automating a database maintenance task means scheduling a database maintenance task to run automatically without any manual intervention. What are the benefits of Automating Database Maintenance Tasks? Automating database maintenance tasks saves time and effort, helps to standardize the process and makes it easier to execute it on a regular basis, and timely alerts configured for an automated job failure can also speed up the process of identifying the cause of a problem if the task fails. How can you Automate Database Maintenance Task? One of the advanced uses of the SQLCMD utility is the automation of database maintenance tasks. 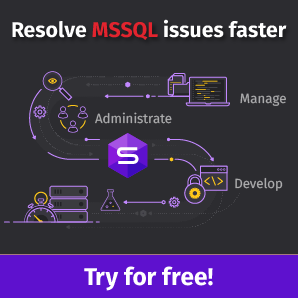 We are going to automate database maintenance tasks without using SSMS (SQL Server Management Studio) in this article. 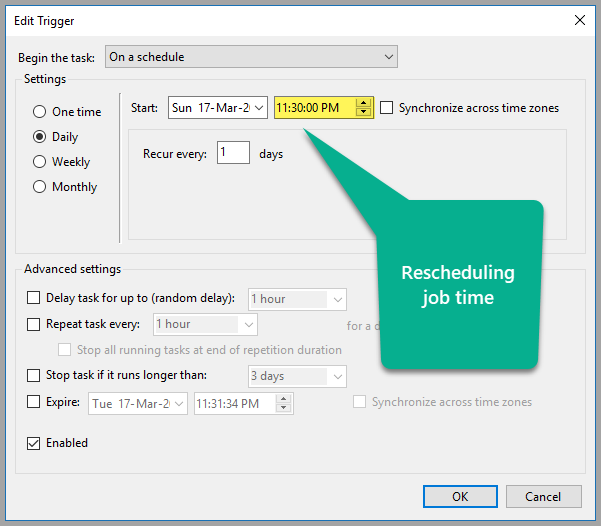 We are going to take advantage of Windows Task Scheduler to automate database maintenance tasks which does not require SSMS (SQL Server Management Studio). 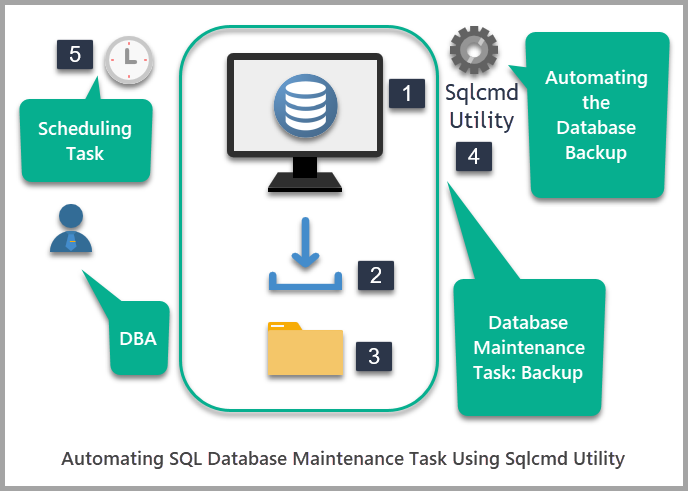 This article assumes that you have basic knowledge of database maintenance tasks performed by running T-SQL statements along with a basic understanding of the SQLCMD utility. 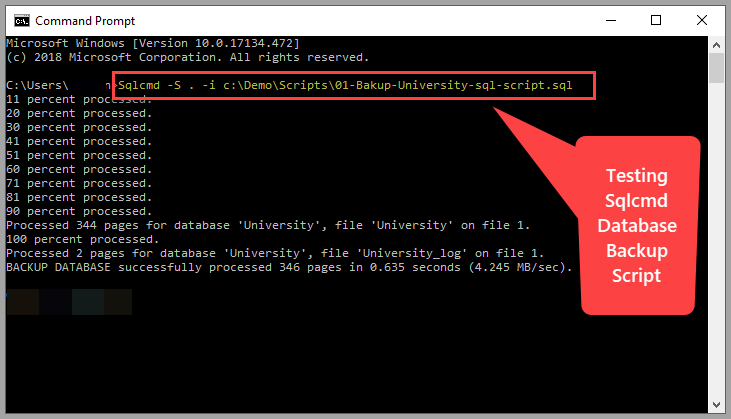 Please refer to the article Basics of Running T-SQL Statements from Command Line using SQLCMD to get some solid understanding of SQLCMD basics, before proceeding to its advanced use. Please also refer to the article Running SQL Database Maintenance Tasks Using SQLCMD to learn how to perform SQL database maintenance tasks. This article also assumes that a sample University database has been created. 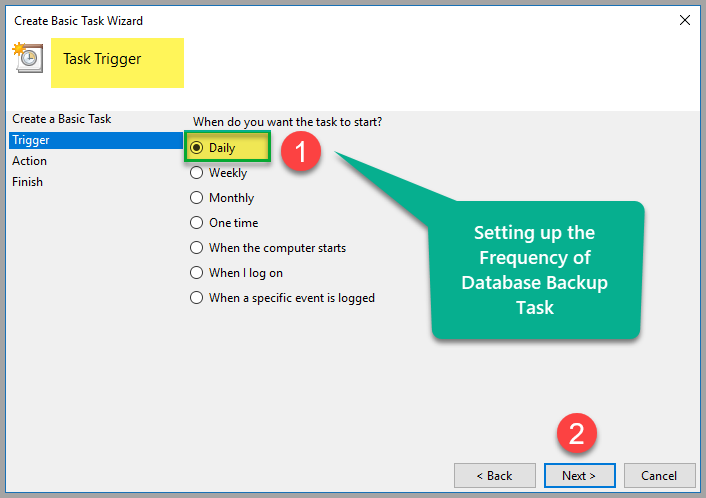 Let’s take a look at the scenario where database backup needs to be automated. A DBA was asked to automate database backups showing date and time of the backup to save time and avoid confusion over the latest backup and speed up the overall process. 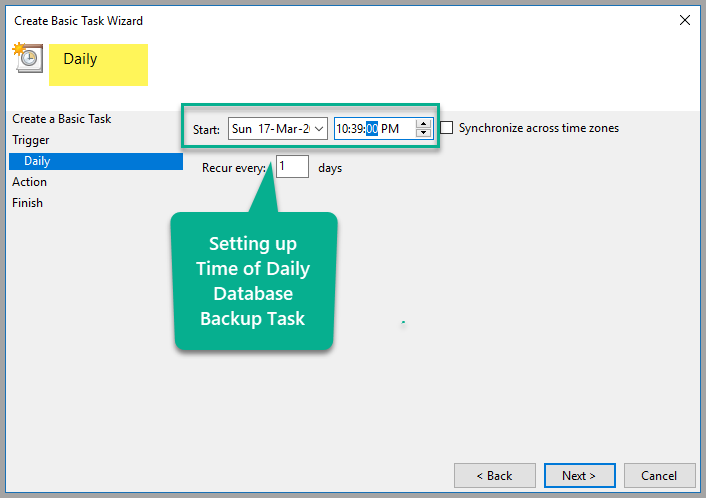 To meet these business requirements, an SQLCMD script which creates database backup needs to be run in the Windows Task Scheduler. Please note that we use drive C for demo purposes only, please use a backup drive in real time scenario. 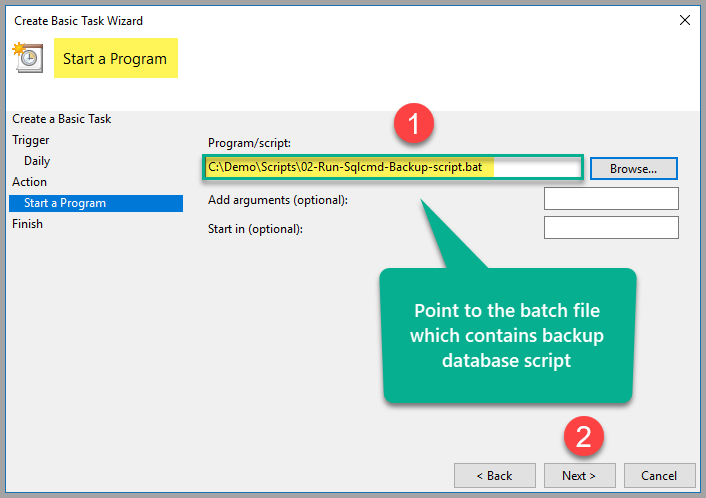 Save the SQL backup script in C:\Demo\Scripts folder. Where “.” (dot) is the default unnamed SQL instance here which can be replaced by a named SQL instance such as .\<InstanceName>. The script ran successfully, so we are good to go. Go to the Backups folder and delete the backup which is created as a result of the test run. Please note that there is a slight change in the SQLCMD script: -E is added, which is actually the default authentication option and does not need to be specified according to Microsoft documentation. It is possible that you spent more time on what was set up in the job schedule to complete the job setup, which means that you have to wait for the next day to see if the task is running or not. 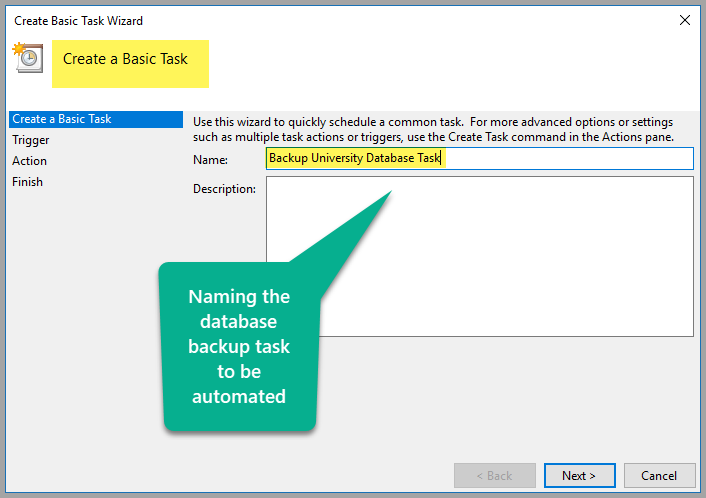 Congratulations, the database maintenance task has been successfully automated using the Windows Task Scheduler, which calls a batch file that runs the SQLCMD script to create a backup file. 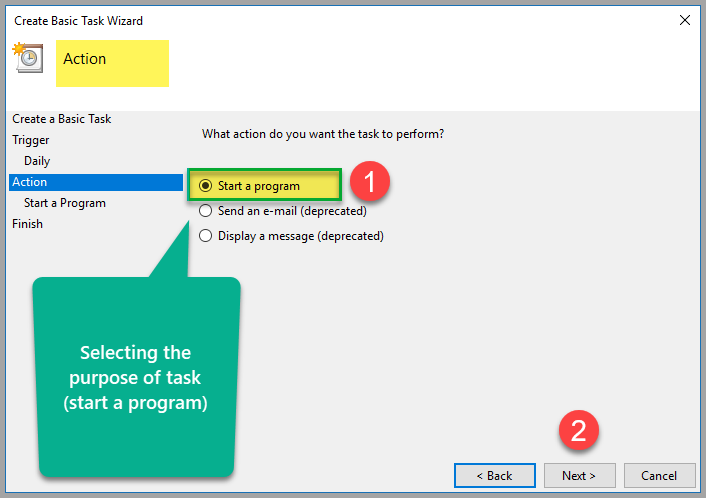 Please delete the automated task which was created for demo purposes once you are done with the walkthrough and are not interested in running it further. Please try to set up and automate the backup of a sample database SQLBookShop mentioned in the article Simplifying Unit Testing Main Stored Procedure Which Also Calls a Utility Procedure. 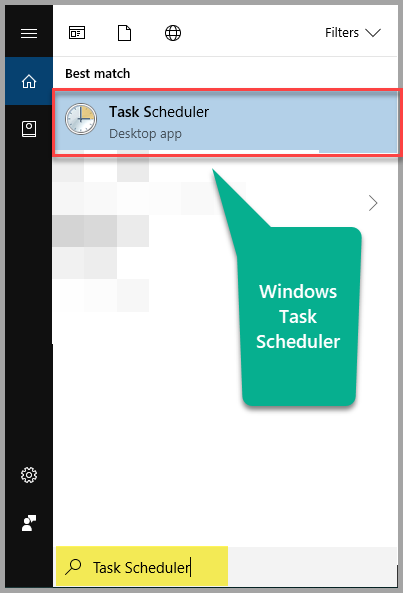 Please try to create multiple databases and automate their backups using the SQLCMD utility with Windows Task Scheduler. 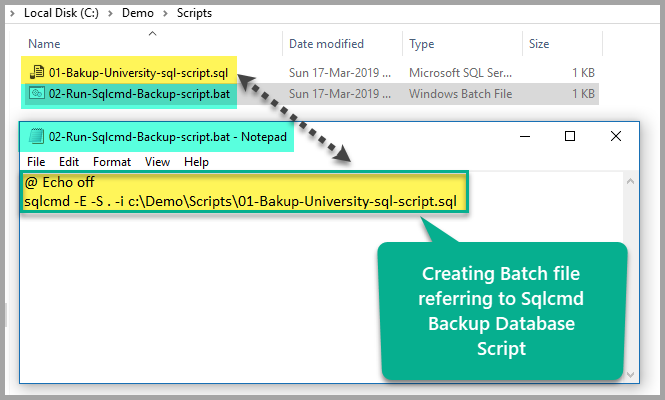 Please try to automate the backup and restore database processes by creating two batch files, one for backup and the other for restoring the database referring to SQLCMD scripts and scheduling the job in the Windows Task Scheduler to run daily.